Those who want to refresh their knowledge about HTML5 markup language may click this link and read the relevant info. The templates are responsive, which provides excellent user experience on all devices no matter what resolutions they support. Some parts of the HTML templates are built using Bootstrap framework, so all powerful Bootstrap styling options, scripts, and components are available for you. Extensive documentation is attached to each product. These brief manuals give detailed instructions on how to install and customize the template. Besides, you can use these handy cheatsheets to find product’s features, as well as what plugins are used or can be used in the template. Cross browser compatible templates will be displayed properly in all modern browsers, including Google Chrome, Internet Explorer, Mozilla Firefox, Opera, and Safari. Font Awesome icon font is included in website templates. This means that you will be able instantly customize size, color, drop shadow, and just anything that can be done with CSS. The templates also offer the variety of fonts thanks to Google Webfonts service. This gives you the choice which font to use for your website. The templates have a working search box, the contact and subscription forms. The instructions on how to use them can be found in the documentation provided with the template. NB! Please check out the following free resources that will help you fill in the gaps in your knowledge or just prompt how to start and run your online business and be a success. Startup Basics – with the help of this course you will see how easy it is to turn your idea into a productive resource in a fast and efficient way. 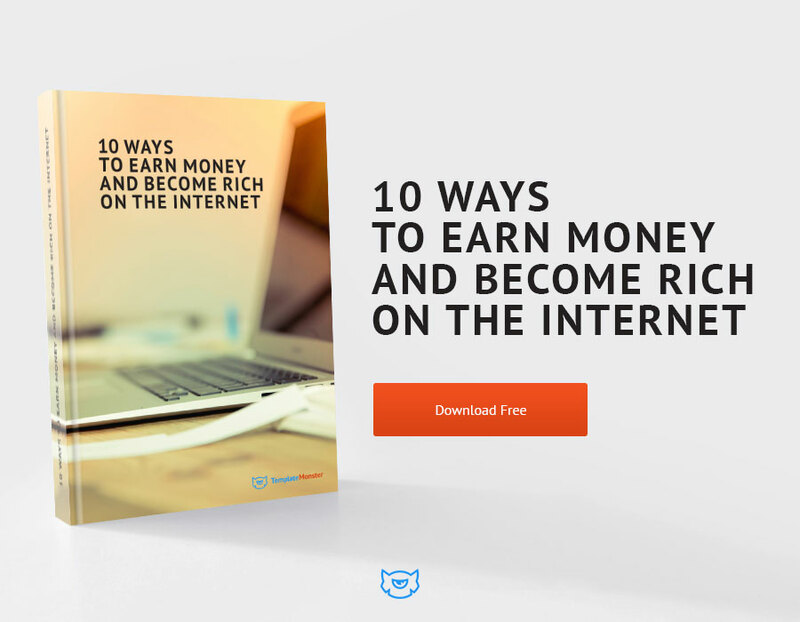 Free Webinars – will teach you how to grow a website from nothing but your own talent, skills and drive. Have a nice efficient browsing! 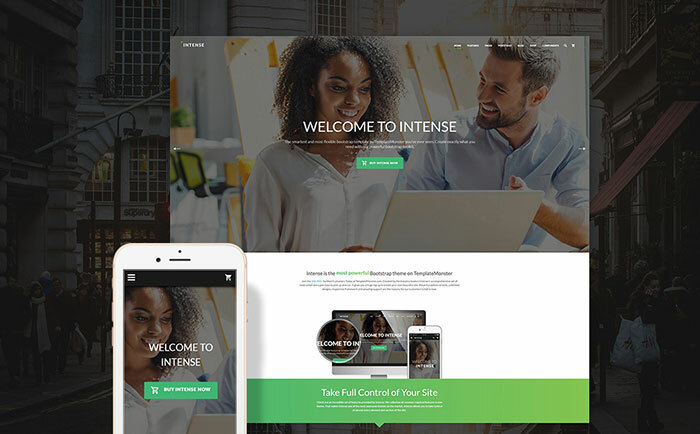 Intense is a feature-rich, multi-purpose responsive website template that comes loaded with everything you may think of when launching or upgrading your blog, portfolio, business website, corporate web page or an online shop. 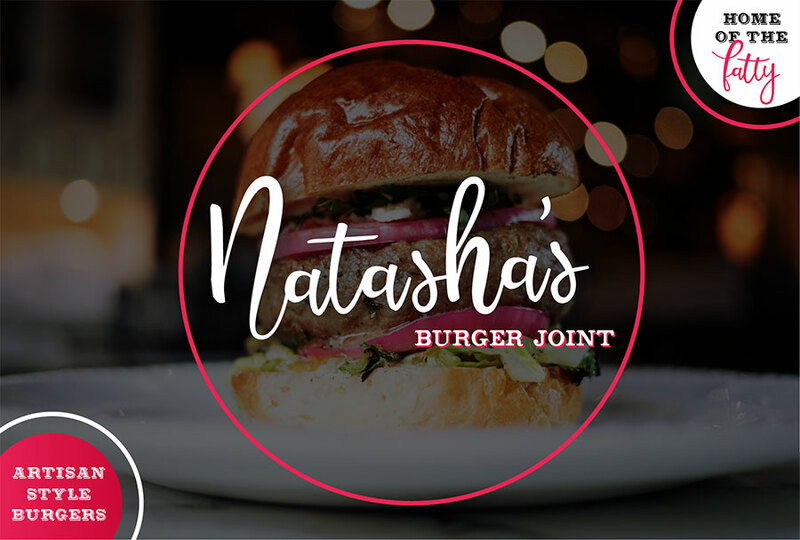 Its contemporary layout was created to be highly flexible and dynamic, so that you could tweak it the way that will ideally match your brand identity. 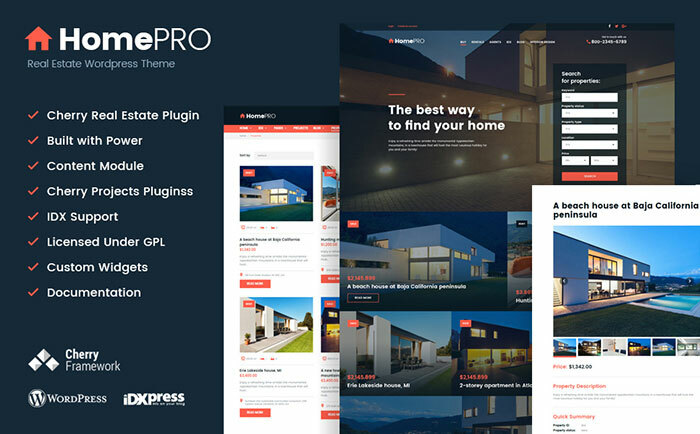 The theme comes to you pre-loaded with a bunch of pages that are ready to go right out of the box (like 20+ Portfolio pages, 30+ Blog pages, 10+ Shop pages, 60+ pages for components, etc.). In addition to the immense variety of smart customization options, social media integration, rich UI kit and loads of other options, Intense includes child themes all of its owners can access for free. Regular updates, 24/7 free support, RTL support, and an array of other features are surely included into the pack. 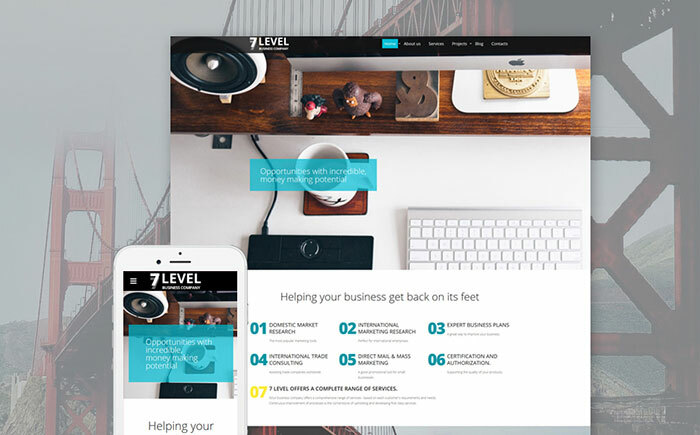 This responsive Bootstrap template allows you building a professional, easy-to-use business site on its basis. Sticky menu of the theme facilitates swift navigation, understandable icons make the content easy to scan. 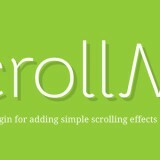 Parallax scroll adds the feel of depth to the layout. 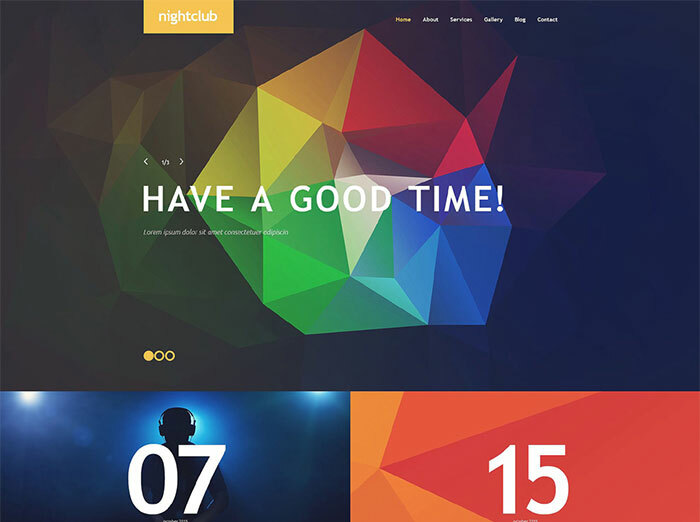 The theme makes use of trendy transparent elements that just look good. 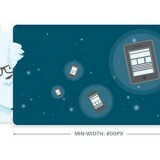 The template comes with two headers (centered and hamburger) and two footers (centered and minimal). Your projects can be presented in masonry, grid, list, and justified styles according to your personal taste and corporate requirements. 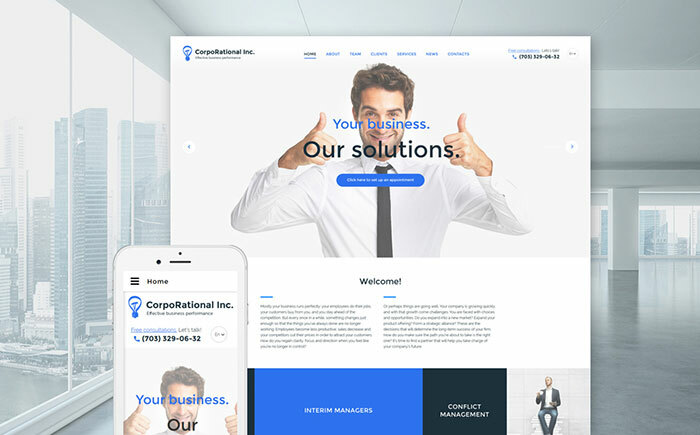 Business firm site template is built with a valid, semantic code for faster page loading and supplied with PSD files for easier editing. 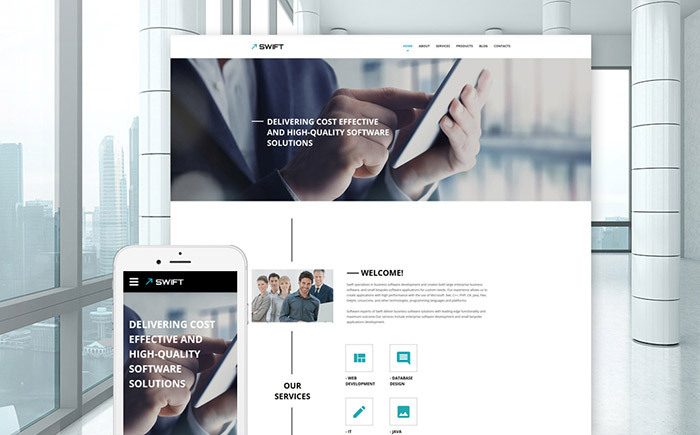 Swift top-notch business website template was developed specifically for corporate websites. It has a clean, minimalist, styled as a timeline layout, which helps you display your content the most efficient way. Such kind of information display automatically focuses visitors’ attention on the most important aspects. 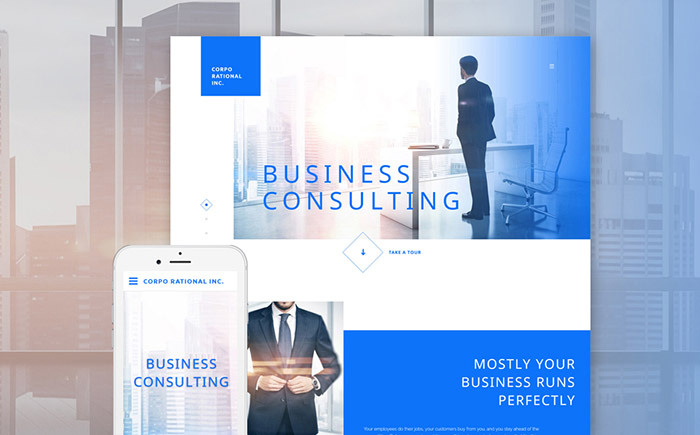 The template is also supplied with parallax scrolling effect, stick-to-top menu, animated progress bars, and many other current design features. It comes with a professionally designed ‘Contact Us’ page, containing Google Maps, feedback form, content blocks for your contact information, and Olark Live Chat module for real-time customer support. 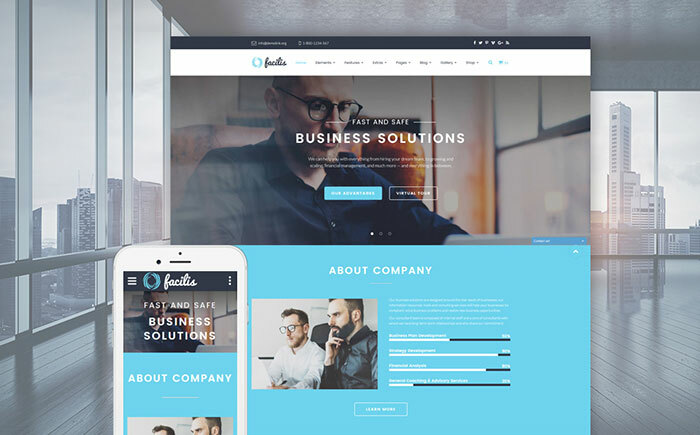 Facilis Bootstrap Template will become a rock-solid foundation for your business website. 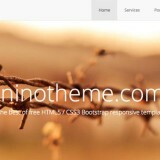 As we have mentioned above, the theme is running on Bootstrap framework. This ensures its seamless adaptation to any screen size. Main navigation panel of the web page is presented with a sticky drop-down menu. Advanced live search is available for utmost visitors’ convenience. Multiple page layouts, blog and eCommerce functionality are integrated into the theme. A variety of working forms, a rich UI kit, and several gallery types are added to help you build a web page oriented on high conversion. 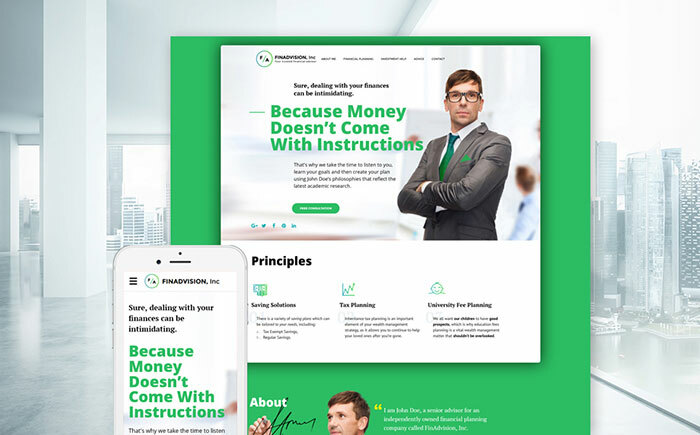 This professional responsive Investment Advisor Website Template fits for a wide range of businesses dealing with finances, law, marketing and similar activities. 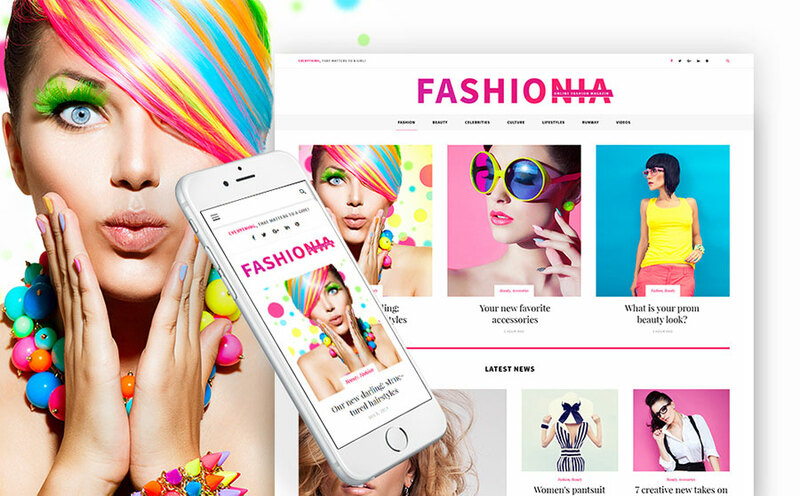 It is based on the popular Bootstrap 3.3 CSS framework, helping designers build contemporary responsive websites. The template is equipped with a selection of specific-purpose pages. Each of them comprises unique forms and UI elements. 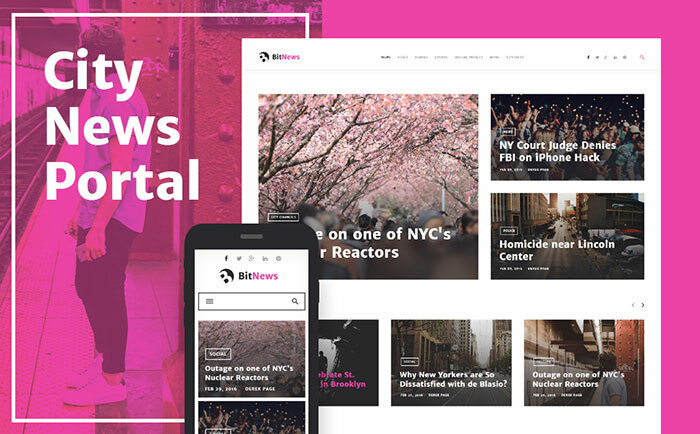 The template has a stick-to-top menu bar boosted with call-to-action buttons, and a multifunctional mega footer, where you can place components like newsletter subscription form, contact info, social sharing buttons, or just custom blocks with plain text. This theme is mobile-friendly and cross browser compatible. Thanks to these features your website will look perfect on any modern hand-held browsing device. 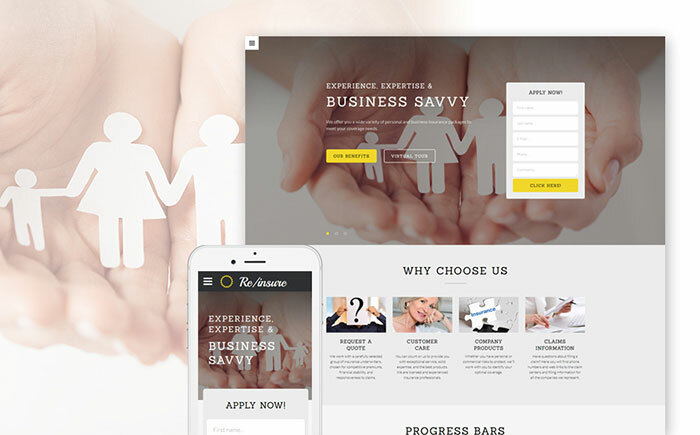 This responsive Business Bootstrap Template is ready to meet the needs even of the most demanding online entrepreneurs. Each of the theme’s design elements has a pixel-perfect design. Supplemented with a thought-out arrangement of content blocks, a bunch of additional pages, and extra functionality powered by the integrated third party plugins (e.g. Olark Live Chat), your website will burst the Internet. Lazy load effect contributes to your visitors browsing experience. 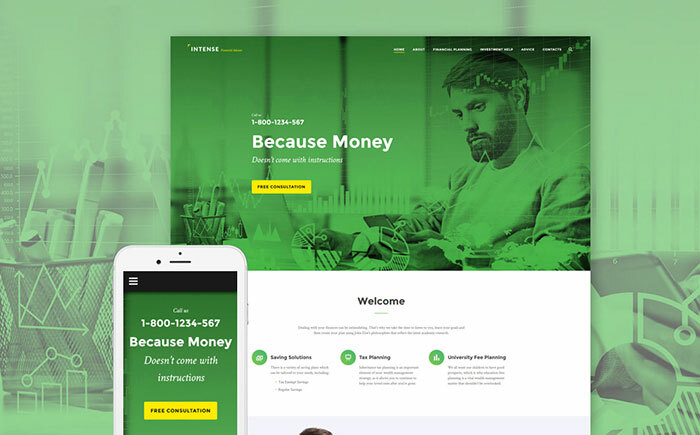 Take your time to browse through the live demo, and see all the impressive features of this business website template with your own eyes. 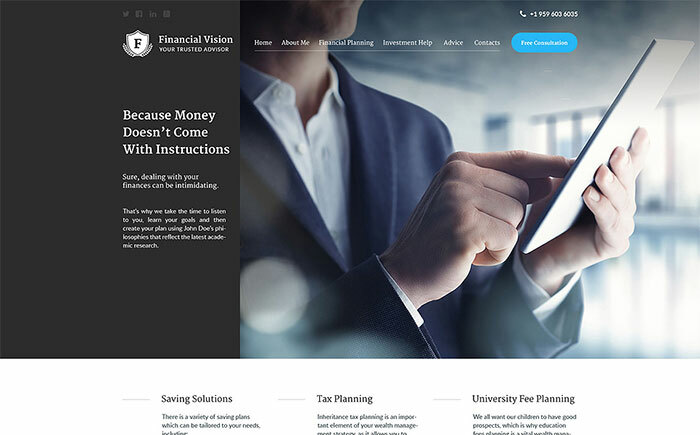 This financial consultant web template has absolutely everything to present your company in an informative and professional way. Everything starts with a full-screen slideshow, which reveals the key points of your business. You can choose from grid, masonry, justified, and list styles of portfolio to present your latest projects. Multiple filters make it easier for customers to find the project of the category they are interested in. Company services stand out arranged in the special boxes. Large headings and icons help to make your presentation memorable. Parallax and hover effects revive the page, which helps to make the content more engaging for the visitors. 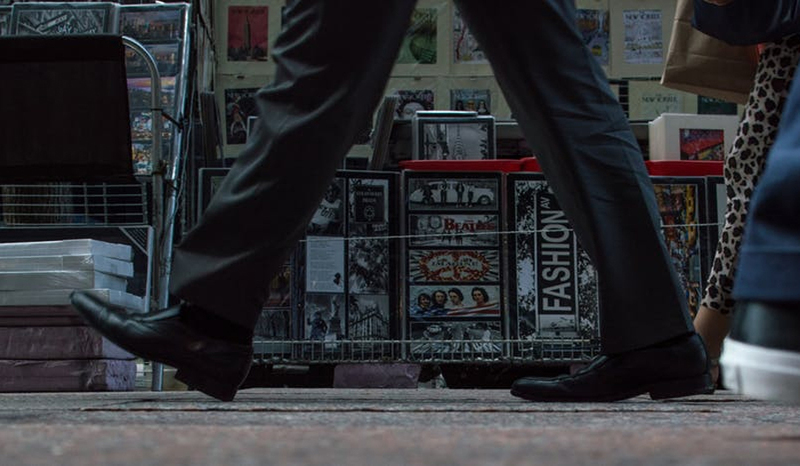 To add a final stroke to your business presentation, you can fill the footer with an archive, location of offices, contacts, a few projects, and links to social media profiles. 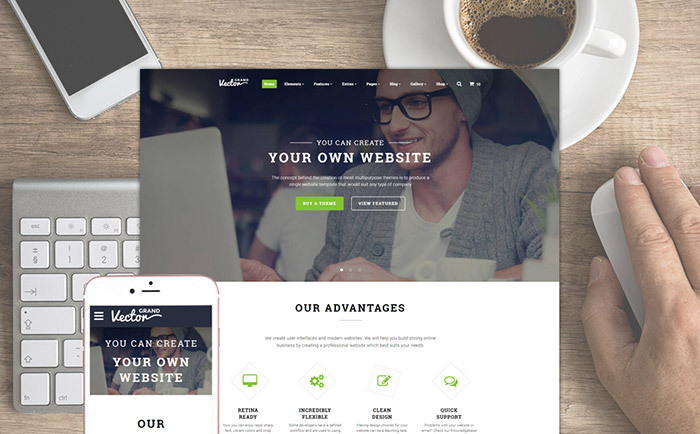 This website template offers you almost unlimited possibilities for building a one-of-a-kind website with cutting-edge design, clean code and whole lot of pre-designed pages for all business niches. 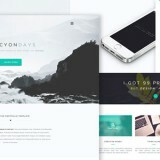 Whether you want just to tune-up or deeply customize both style and layout of your website, be sure, this template is easy to master and operate. It boasts a spacious multicolumn drop down menu, which sticks to the top of the page as you start to scroll down, large responsive sliders, inviting ghost buttons, rich typography options, and a plethora of other features. 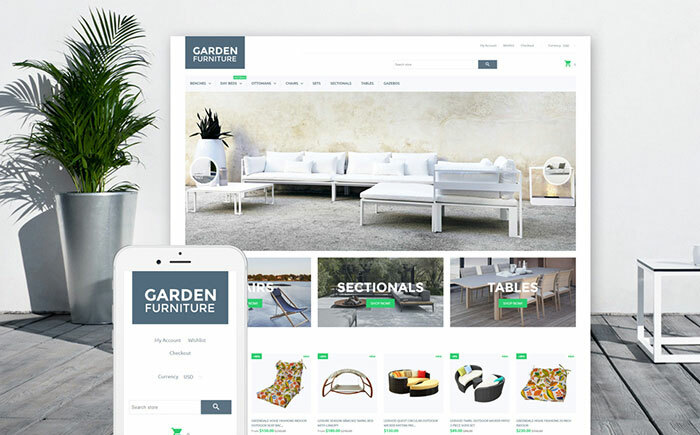 Besides, the theme comes with the full set of conversion-first eCommerce pages, allowing you to launch a thriving online store quickly and effortlessly. To top it off, it’s worth to mention that the template has an integrated live chat module to kick-start the customer support provided by your company. 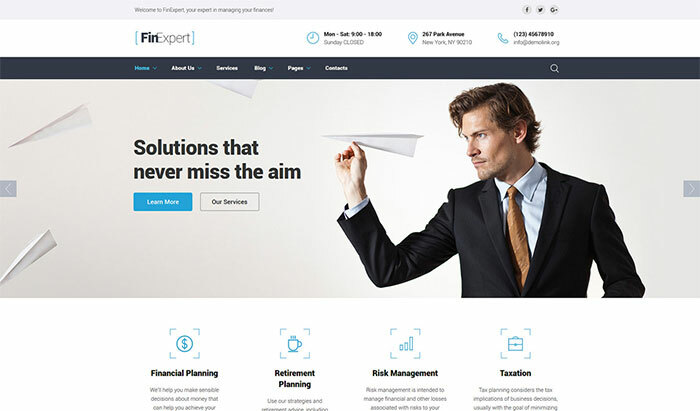 This Financial Advisor Website Template is a multi-purpose solution coming loaded with an array of smart customization features and a powerful dashboard. The theme has a fully responsive layout built with Bootstrap 3.3. This guarantees that your website will run flawlessly on any device. With a number of pre-designed layout elements, the theme adjustment gets way simpler and faster. You can choose from multiple ready-made header and footer variations, UI elements and blocks. Site navigation is also thought out. The theme is pre-loaded with live search and a sticky drop down menu. Newsletter subscription form, contact form and contact details are intended to help you build the community of customers around your project. User testimonials section adds credibility to the website appearance. Would you like to have a professionally built website for your Business Bureau? Here it is. The layout of this theme looks clean and accurate. Main menu of the theme is hidden, but it opens full-screen on hamburger icon click. Look at theme’s vertical slider, ghost elements, neat icons, quality visuals and well-balanced color scheme, they make the template current and trustworthy. Fluid design elements and grids allow the design to adjust smoothly to any screen size that it’s being viewed on. Valid, semantic code, Sass, HTML plus JS animation, a cross-browser compatible framework, and a heap of other features come with your template. The theme is fully customizable and easy to use. 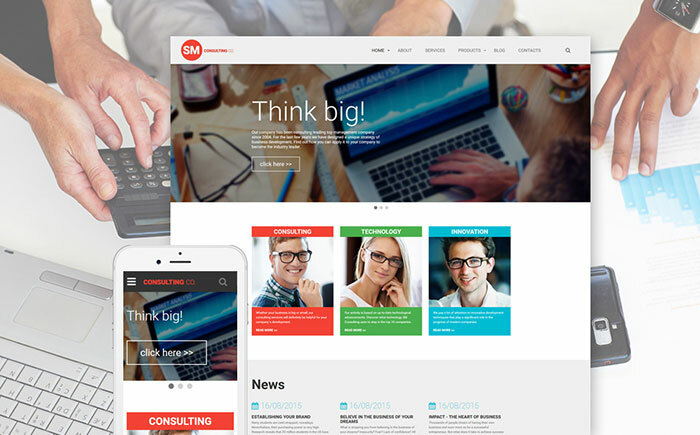 If you don’t like tedious layouts, choose this theme for your business consulting Co. The author has chosen bright colors, trendy outlined icons and flat style for its design. It’s safe to say that the slider, quality images and hover effects make the web page vibrant. The template is well documented, which means that all ins and outs are covered there for you to squeeze the most out of the future website’s functionality. PSD files are shipped in the template’s package, so it is fully customizable. Valid semantic code will impress both site visitors & owners with faster page loading speed, better flexibility and great SEO ratings. 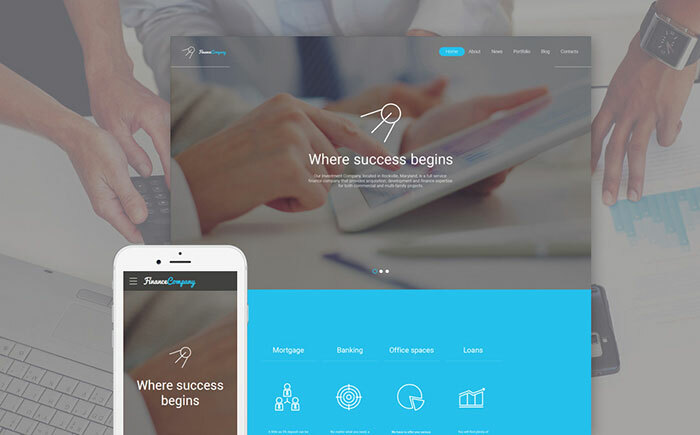 This web template for insurance company provides a selection of pre-designed layouts, pages, UI elements, galleries, and more. With a variety of header and footer types (light and dark, center and hamburger, minimal and corporate), you can experiment until you find the best solution for your website. There are 4 grid galleries for portfolio presentation to choose from. You can add login, contact and subscription forms to keep in touch with your customers. 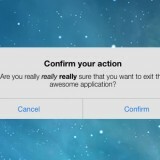 The theme supports social login to facilitate visitors authorization. 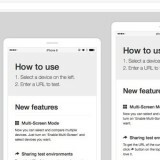 Bootstrap 3.3 integration means that your site will be quite usable on any device, be it a smartphone or desktop computer. Employment Web Template is aimed for a job portal where one can search for vacancies or employees for his/her own company. There is a simple search form at the header. The visitor can use it to look through all available vacancies suitable for their skills level and other requirements. Main menu bar of the theme is sticky, so the needed navigation links are always before the users’ eyes. BTW, you can filter jobs by categories using visual green banners. Hot jobs from the blue-chip companies are listed below them. Testimonials section is displayed in the form of a slider. Latest blog posts are featured in trendy Instagram style. You can embed posts in audio and video formats as well. This will engage more visitors to your website. This theme is a member of the vast ‘Intense’ family. It offers its owner a really rich functionality. Working Ajax forms, parallax scroll, Isotope filtering, cross browser, ultra responsive, optimized for speed, valid semantic code, SEO optimized, 24/7 premium support… This is just a brief list of the awesome features you get with this high-tech theme. Green colour present in the layout of this theme is associated with the financial growth and stability. With a solid library of Google Fonts that are easy to implement, you will be able to create a unique look of your website. Doing whatever changes to you website, be sure, it will look and perform the same perfect in all browsers thanks to the cross browser compatibility of this theme. 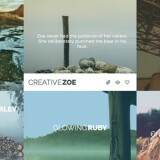 Previous story The Best 15 Multipurpose HTML5 Websites Templates Especially For You!